Christmas 12 Pack. A fun and easy activity for children to colour and play with. They measure approximately 20cm. 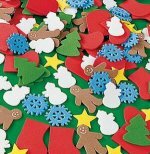 Pack of 200 Christmas foam shapes. A fun essential for children. They love to decorate cards and make pictures with these shapes. Lots of fun for opened ended play and art work. 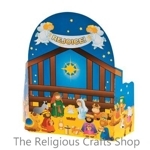 ALWAYS POPULAR IN SCHOOLS AND CHURCHES. Each shape measures approximately 2-3cm. Red Foam Christmas Stocking Craft. A lovely craft for children to make and then decorate to make it individual and personal. Large hole needles are needed for sewing. 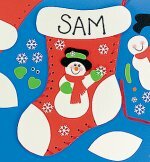 Red ribbon is provided to thread through the holes already set in the stocking to make it easy to sew. Then all the decorative accessories are provided to make the stocking special. Stocking measures approximately 27cm by 16cm. Ideal for filling with little gifts. 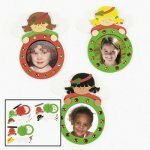 12 pack of Christmas Character crafts. 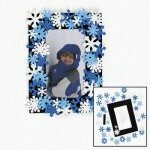 Children love to make these cute little characters and stick them on their windows. 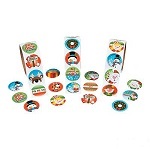 Four different characters to choose in each pack - Santa, Christmas snowman, Gingerbread man and a Christmas Penguin. Children will want to make them all. Crafts measure approximately 8-10cm. Suction cups included. Mega Craft Pack of Glue Dots - 320 dots. 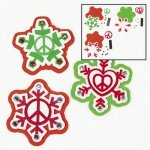 Glue dots are an ideal sticky solution for all kinds of crafts and card making. Easy to use, they stick to virtually anything instantly with no mess. Once you have tried them, you will wonder how you managed without them. Each pack contains 20 sheets of 16 glue dots - 10 sheets of 10mm dots and 10 sheets of 6mm dots. Glue Dots Taster Pack. 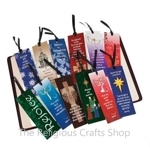 These are an ideal sticky solution for all different kinds of crafts and card making. They stick instantly with no mess. Mini glue dots are ideal for gluing gems, sequins, wiggly eyes etc. Try out a pack - you will wonder how you survived without them. 100ml squeezy bottle of craft PVA glue. Dries clear, strong bond and does not wrinkle paper. This adhesive is permanent and cannot be reversed. CHILDREN MUST ALWAYS BE SUPERVISED WHEN USING THIS PRODUCT. Christmas fun 12 pack of Christmas Stocking Ornament Crafts. Easy to make and lots of fun. When finished, they look great on the Christmas tree. Finished stocking measures approximately 10cm. Bargain at less than 50p a craft. 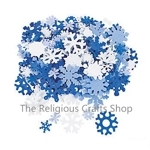 12 Large Foam Snowflake Stamps. A great Christmas extra to have in stock. 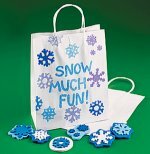 Use with paint or printing ink to decorate fabrics, bags and display paper. 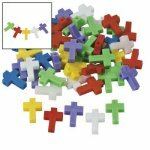 Popular in schools and churches. Stamps measure approximately 8-10cm.